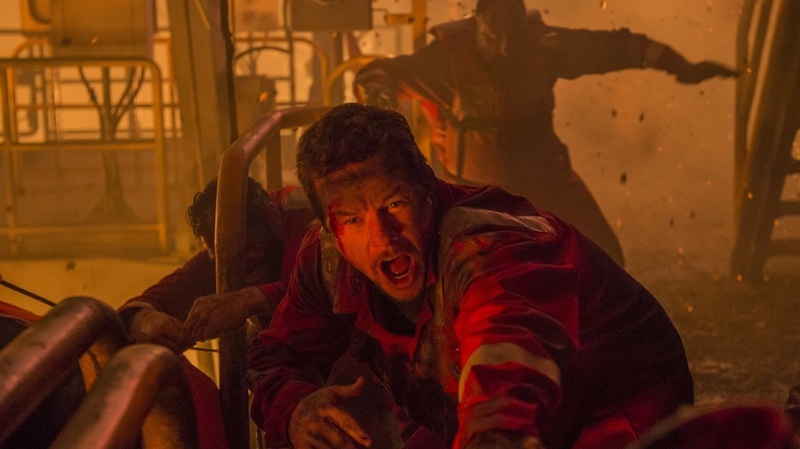 'Deepwater Horizon' Honors The Sacrifice Without Sacrificing The Action Deepwater Horizon is the tense and terse story of the Gulf oil rig explosion that became the biggest man-made ecological disaster in history. Mark Wahlberg in the terse, tight Deepwater Horizon. One of the nation's biggest environmental disasters is now the season's big disaster flick. Sound insensitive? Well, rest assured the filmmakers were aware of — and have managed to sidestep — any qualms audience members are likely to have. Deepwater Horizon tells the story of the oil drilling rig that turned into an inferno in 2010 off the coast of Louisiana — a story of tragic, entirely avoidable missteps and astonishing personal heroics. Engineer Mike Williams is our entry point to the story. Played by Mark Wahlberg, he's sort of a Mr. Fixit on the oil rig Deepwater Horizon. He knows how everything works. We in the audience, though, need to be brought up to speed, so the film starts with a nifty demonstration on his kitchen table. His daughter is working on a school report and Mike offers to run props for her. Explaining that pulling up oil from hidden depths makes her dad something of a "dinosaur tamer," she reads, "oil is a monster, like the mean old dinosaurs all that oil used to be. For 300 million years they've been squeezed tighter and tighter, until Dad and his friends put a hole in their roof." Mike grabs a soda can, and punctures it with a metal thingy. "Freedom, so they rush to the new hole, and they run into this stuff called mud." As she's talking, she pours honey down the straw, and darned if the honey doesn't block the soda, just like it's supposed to. Mom and Dad are proud. "Stay 10 forever please," Mike says as they walk away from the kitchen table. But before they get three steps, the honey gives way and there's soda on the ceiling. Time to head to that oil rig — Deepwater Horizon — by helicopter, because it's 50 miles offshore. Mike and the relief crew, which includes rig driver Gina Rodriguez and safety guy Kurt Russell, are surprised on arrival that some safety tests are being skipped. Mud gets poured and it starts to act alarmingly like the honey in the kitchen. Deepwater Horizon is technically impressive, but it can also be humanly intimate. Russell keeps ordering more tests; BP oil exec John Malkovich — who is "oily" — keeps talking about how far behind schedule they are ... and the rest, as they say, is history. Director Peter Berg spends the first part of the film finding intimate omens for the disaster to come — the splashed ceiling, the car that won't start at a crucial moment — then delivers catastrophe on an almost biblical scale: glass shattering as it is hit by gale force sludge; dying, oil-soaked pelicans falling from the heavens; flames leaping skyward from a drilling rig turned floating volcano. The technical work is impressive enough that it's almost miraculous that the focus stays on the human beings at the inferno's center. Real people, 11 of whom died in what is arguably the globe-scarring ecological disaster of our time. So you can't help marveling at the tightrope the filmmakers walk: honoring their courage and sacrifice while making an action flick entertaining enough to justify the more than $100 million it took to make it come alive on-screen. And come alive, Deepwater Horizon does, in 107 minutes of terse, tight storytelling, a good 95 of which are white-knuckle tense.